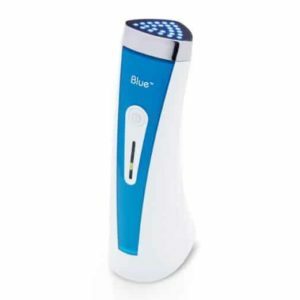 Blue light therapy devices for use at home have been clinically and scientifically proven for the treatment of mild to moderate inflammatory acne, and are rapidly becoming a must-have gadget for many individuals. These relatively inexpensive, easy to use machines offer similar technology to what is used by dermatologists. The cost for these types of devices ranges in price from around $30 to $600, so compared to professional treatments you might consider them a bargain. Cons: You have to replace the 30-treatment Activator after 30 treatments, so that adds additional cost to the device. The very popular Neutrogena Light Therapy Acne Mask will help to clear and heal the skin. It is a mask that is safe to use and comes with one 30-treatment Activator that will last for 20 treatments. You have to buy additional 30-treatment activators separately. To do the procedure, you put on the mask for 10 minutes a day. It works for all skin types and tones and is chemical free and safe to use. Users love that this is a useful, budget option to use blue light therapy. A lot of users don’t love the idea of having to replace the activator after 30 uses. 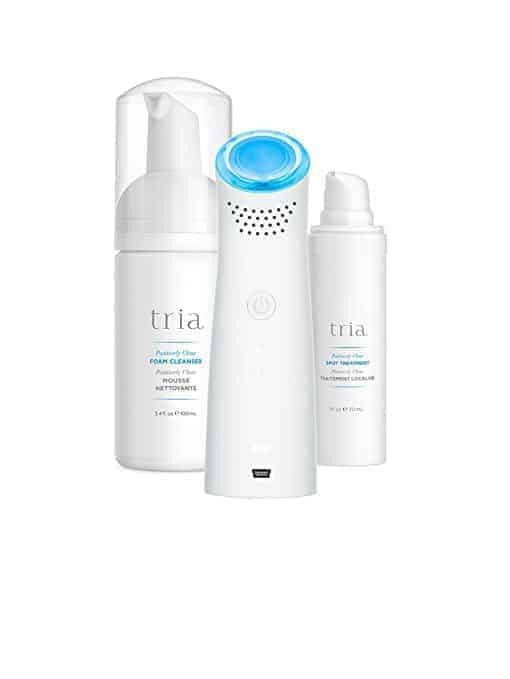 The Tria Acne Clearing Blue light is very useful for mild acne and breakouts. It is intended to be used with Tria foam cleaners and other serums, but it can be used without. One advantage of this device is you can return it within 90 days if you find that it isn’t working for you. Blue light treatment won’t work for every type of acne, and the Tria at least lets you find out for yourself if you make a good candidate. For those that it works for, it works well, and many individuals find that the steep price is well worth it. The MD Blue isn’t cheap, and most people will have to carefully consider if this is worth it before buying. If you buy it directly from Baby Quasar, there is a 90-day money-back guarantee along with a lifetime warranty, so if you find it isn’t working for you should be able to return it quickly. The bigger treatment head on the MD Blue means that you will be able to spend less time on treatments per day. It claims to be the fastest, most potent blue light therapy tool available, that will let users treat their entire face in 16 minutes per day and only have to use it one to three days per week. So if you are short on time and don’t want to have to spend a lot of time doing these at home treatment, this is probably a device worth considering. It works well, but you have to be patient, and you need to follow the recommended time- 16 minutes per treatment. It won’t give you quick results. 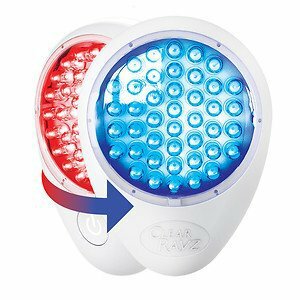 Kills the bacteria that causes acne with blue light, and reduce inflammation with red light. The illuMask is an at-home LED light therapy mask that you wear on your face that only costs $30. 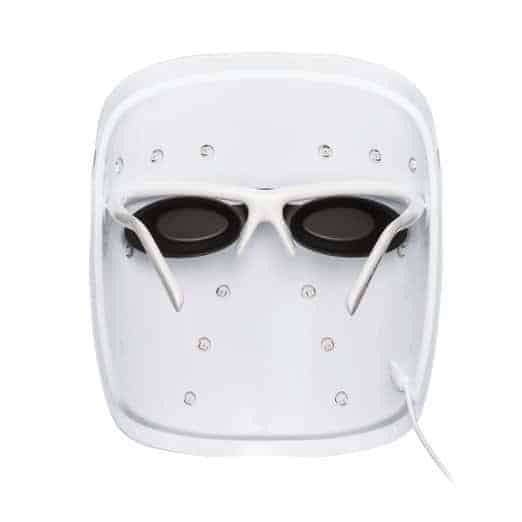 This mask is different than other treatments as you are just meant to use it for 30 days of treatment, and then you throw it away and get another one. If you only want to use it for 30-day treatments every now and again, it is an inexpensive way to get at home blue light therapy. If you want a product to use every day for an extended period, there are better options as this one will cost you $360/year to use ($30 x 12). A lot of users have had great results with the improvement of their overall skin condition giving them fewer blackheads, smaller pores, etc. Many users find that it isn’t convenient if you want to do something else while using it. Some users see it doesn’t work for them at all and are bothered by the eco-unfriendliness of using a product for 30 days and then throwing it away. Silk’n Blue Acne Solution Device is another well-known brand that produces light therapy at home devices. The Silk’n Blue is a solid entry-level device that gives you all of the benefits of blue light therapy at a reasonable cost. It should last for 300 hours, which is the equivalent of 6,000 three-minute cycles, so you should get a decent amount of use out of it. It is recommended that you use it 3 minutes over each target area, two times a day until the breakout has cleared. It has a contact sensor, a temperature sensor; automatic shut off as well as a pretty big treatment area of 3.14-inch square. It uses a 414nm blue LED light as well as while sonic vibration and gentle warming help open pores, so bacteria have nowhere to hide. Reviewers note that it works well if used correctly, some users mention the long cord as a bonus. Many users find it difficult to find the time every day to use the device as directed if you have multiple areas that you need to treat. If you only have one area, then it is easy to find the time for that. Pros: Sleek, comfortable to hold design. Cons: Just like all of the other at home devices it takes time to work. 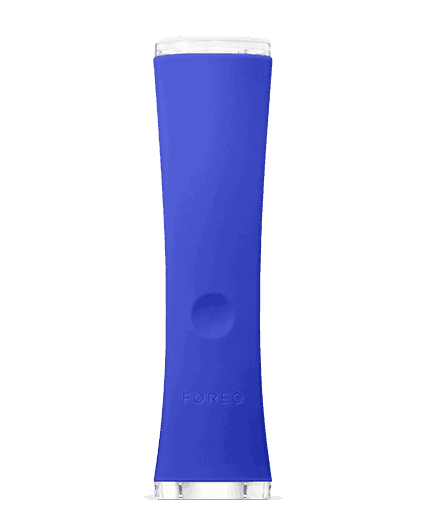 The Foreo Espada At-Home Blue Light Acne Treatment Device is one of the newer higher-end options in the fight against acne. 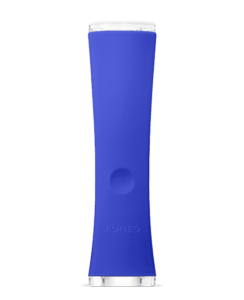 It uses a blue LED light and T-Sonic™ pulsations to treat the acne-causing bacteria. It is easy to use, effective and gives excellent results. Reviewers note that this is a handy device if used correctly and consistently. The battery life could be longer. Pros: More moderately priced than other Baby Quasar products. Comfortable to hold, easy to use. Cons: You can only use this once a week per side. What do users love? Users love that it has both the red and the blue light available to get both the bacteria killing and the inflammation reduction benefits. LightStim is another popular option to help clear up acne breakouts. It is useable on any type of skin. It can also help to stop existing breakouts and cut down on redness and inflammation. You can use this light daily when you have breakouts and then cut down to only 2 or 3 times once your skin is clear to help maintain smooth and clear skin. LightStim was one of the first companies to put out this kind of device, and it continues to innovate with technology for skin treatments. It works well if you include it in an overall routine that consists of a good face cleaner and eating well. Most users also find that it is easy to use. What is Blue Light Therapy and how does it work? Blue light therapy is a form of LED light therapy that individuals can use at home to help acne-causing bacteria. Some of the devices that you can buy for at-home use are just as effective as the therapy you can get at a dermatologist’s office. Acne breakouts occur when the sebaceous glands produce excess sebum (oil). Then the P. acnes bacteria feed on the sebum and multiply, causing pores to clog and trap the P. acnes bacteria. White blood cells move in to fight off the invading bacteria, which end up creating pimples. 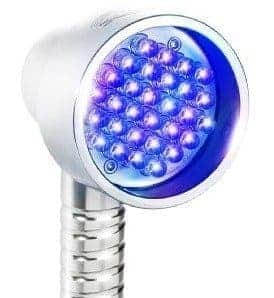 The way that home-based systems work is that a blue LED light kills the acne-causing P. acnes bacteria, which clears existing blemishes and helps to prevent future outbreaks. What type of acne does it work on? Does it help with scars? At home LED blue light products are intended to work on mild to moderate acne, and will not work on severe or cystic/nodular acne. Light-based treatments are useful if the acne is bacterial based, not hormonal based acne. Some devices contain both red and blue light. The blue light kills acne-causing bacteria, and peaks around 420nm, which is the ideal for acne treatment. The red light is used to speed the healing of scars, and reduce inflammation. The red light wavelength is between 630nm and 660nm, both of which have been proven to speed healing and reduce inflammation. Light therapy is usually administered with at-home devices once or twice a day depending on the product. How long do you need to use the device for each session? Each product has slightly different treatment times. They range from 3 minutes per area for a handheld device, to 20 minutes if you are using the mask or three-panel design. What is the frequency of the light? The frequency of the blue light LEDs is usually around 414-420nm. If the unit uses a red light as well, it is generally in the range of 630-660nm. Can the LEDs used damage your eyes /do you need to wear eye protection? These devices do not pose a risk of damage to the eyes when used as directed although many users prefer to use protective safety glasses as a precaution, as the concentration of light may in some cases damage the retina. Will you need to replace the head of the device? Some devices have replaceable heads that may be useful if you are sharing it between family members to help keep things sanitary. If it is only one user using the head, most devices won’t need to be replaced too often. Before buying, check whether it uses a replaceable head, and the number of hours it should last before having to be replaced. Is there any UV danger when using a Blue LED light? No. The Blue Light to fight acne bacteria does not use UV light. They tend to use 414nm blue LED light, which is not a UV wavelength. These products are clinically proven to clear acne. However full clearance of breakout areas varies from person to person. In most cases, you can expect to see a difference after two weeks of use. Are they safe to use on all skin types? Blue LED light technology has been clinically proven to be used safely, without side effects, on all skin types. What age can you use these devices? They should not be used unsupervised by anyone under the age of 14. Can it damage or darken your skin? Under normal operating circumstances, the temperature remains at a comfortable level and will not damage or darken your skin. Be sure to read and follow all accompanying instructions. Generally, there aren’t a lot of different features on Blue LED Therapy products. The difference in the price of various models stems from the size of the treatment area, and whether you are looking for a unit with different types of lights. You also pay a bit more if you buy from the companies that have a more robust return and warranty policies. Treatment Head/Area – One of the most important features to look at is the size of the treatment head. The smaller the head, the longer you are going to have to spend doing the treatments. If you are only treating a small area it won’t be a bit issue, but if you are treating a large area or different parts of your body the time can add up, and some users find that they cannot find the time twice a day to do the treatments. Large, powerful treatment heads treat large areas of your face and body in the shortest amount of time. Corded or Rechargeable battery– Some products are corded while users use a rechargeable battery. There are pros and cons to each type. If you prefer a battery-powered design, make sure you consider how much run time a battery will get from a full charge. Also, if you would like freedom of movement while doing the treatments, you may want to consider a device that has a rechargeable battery, or at the very least a long ac adapter cord. Timer with an automatic shutdown option – This feature will prevent you from accidentally applying the treatment for too long and causing overheating of the skin and wasted time. Interchangeable lights – Some of these products come as blue light only, while others are blue and red light and others have a multiple of different lights you can use interchangeably. Usually, green lights are for hyperpigmentation, the red for anti-aging/skin healing and the blue is for acne. So if you have various skin ailments that you would like to treat you will want to look at a device with interchangeable lights. There are three different types of design styles you can get if you are looking for an at home device. Hand Held-Is the most common design. They are small, convenient for travel; many have interchangeable heads for different light treatments. Easy to use over the entire body and you can use them for areas that are difficult to reach. Handheld devices require a person to hold the device directly on several areas of his/her face. Tabletop Machines– A Foldable Three Panel table design does treatment on whole face and neck. They usually require about 10-15 minutes of treatment, with the user sitting very close to the device. They often come with multiple changeable light wavelength settings (Red, Blue, Yellow, Green, etc.). The main disadvantage of this style is that you aren’t able to perform other activities while doing the treatment since you have to be fully facing the machine. At first glance, these systems are pretty expensive, ranging in price from $200 to $600, or $30 for a one-month treatment mask. 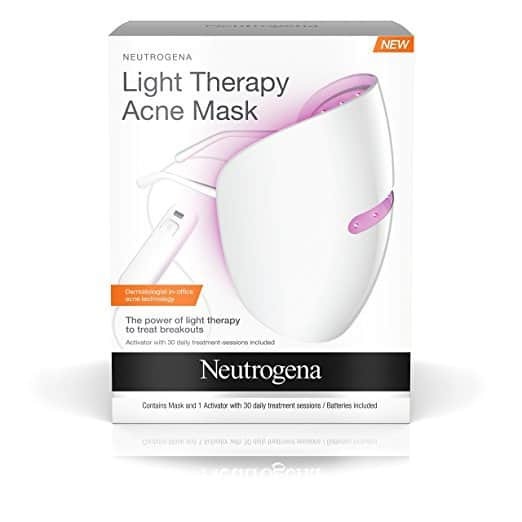 However, if you consider the cost of light therapy procedures for acne if you go to a clinic or a medical spa can range in price from $75 to $300 per session, with a full treatment cycle coming in at $450 to $2,400 total depending on the expense and number of treatments, the at-home device are well worth considering. Most devices will last many years, and you won’t have any maintenance costs, except for the Tria device that we recommend. The Tria requires a $40 more to pay for a 2-month cartridge. At-home light therapy machines have no known side effects, other than the possibility of slight irritation or redness for an individual with very sensitive skin. If you have sensitive skin, you should do a light sensitivity test as recommended in most of these products user manuals. These devices will only work on users with mild to moderate inflammatory acne; they will not work on cystic acne, blackheads, or whiteheads (milia). If you have mild to moderate acne and would like some other non-chemical treatment options, blue light therapy is well worth a try. They aren’t practical for everyone, but if you have the right kind of acne (not severe nodular acne, severe cystic acne or comedonal acne) it is worth a try since it is non-invasive, and much more convenient than going to a professional a few times a week. You also need to make sure you have the time to use the product correctly as directed if you are unable to commit to treatment every day (depending on the device you are considering) it probably isn’t worth investing in one of these machines.